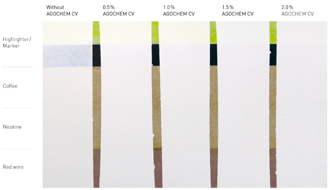 Applied as barrier additive in waterborne interior paints AGOCHEM CV effectively prevents previously existing stains on the wall such as highlighters, coffee, nicotine or red wine from penetrating and showing through. AGOCHEM CV is suited for stain-blocking interior paints and primers. Please find the exact recipe in the product flyer. Our Technical Service is at your entire disposal.